So you’ve caught the diving bug and now you want more bottom time. Let us show you how to use Enriched Air Nitrox to almost double your bottom time, or use it to dive more conservatively. When bundled together with Open Water — Part 2, there is a $50 discount on this course. “Nitrox for free” is a slogan in a lot of resorts. This means that you do not have to pay a surcharge for Nitrox, but all diving operators will want to see a valid Nitrox certificate before you can dive. ENRICHED AIR NITROX contains optional dives and therefore it is a perfect “Winter Specialty” before your diving holiday starts. 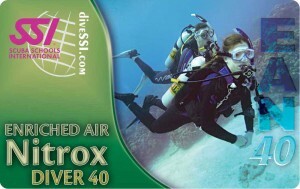 This will allow you to go diving immediately and enjoy the advantages of diving with Nitrox.